Steers, Action Master Ravage, and Electrum Beast! "Thinking their mission over, PRETENDER CONVOY dispatched the Dairycons across the globe in-search of a MOO BASE. But all is not as it seems. While scouting a new location, STEERS is attacked by ActionMaster Ravage! Can Electrum Beast arrive in-time to save his friend?" STEERS is the official herder of the Dairycon Universe. He is on constant patrol, making sure none of the other Dairycons get off the farm. STEERS keeps the whole Dairycon Universe in check. 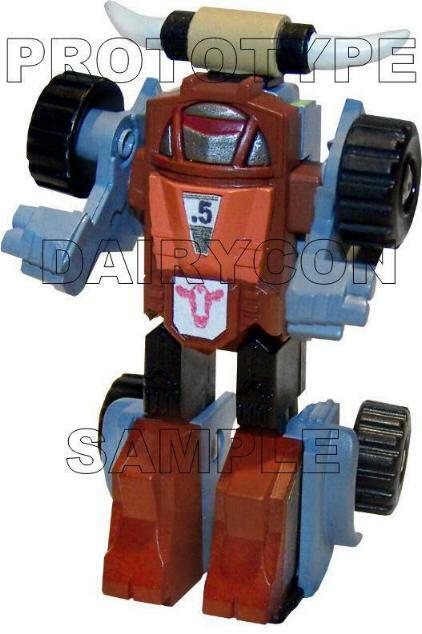 Considered the justice in these here parts; a cattle-rustlin, bronco-bustin, spur-wearin, hard-drinking, fast-living bot. In a barroom brawl he is ready to break a bottle and fight with the best of them. A perpetual ladies-bot who is always saving the damsel in distress. Loves the open range. Rumored that Heffer found Steers on the planet of Junk. 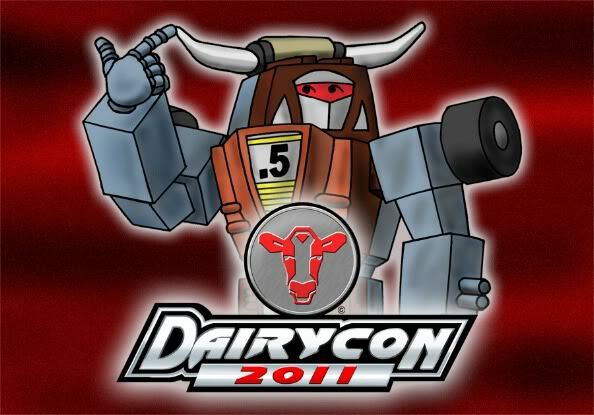 As the official herder of Dairycon, he is the only one who knows the secret behind why Dairycons can have both Autobot and Decepticon symbols. He will never tell, though! That info is what helps him keep the Dairycons from escaping the farm. He is also the only one who knows where UNCLE WHISKEY BREATH keeps his secret still. Though STEERS has no known physical weaknesses, he secretly longs for the day when he can wield the Lasso of Liberty and Hat of Heroism. Quote: "All that's left of me, is what I pretend to be." Once a loyal Decepticon soldier, and later an agent of Tripredacus Council, RAVAGE had the misfortune to try to double-cross a stalwart team of Maximals stranded on prehistoric Earth. Seemingly damaged beyond repair and stuck in stasis-lock, he now finds himself shuffled from one alternate timeline to another as various evil leaders attempt to decipher the information encoded in his memory banks. Now, he has fallen into the hands of The Leader...will his knowledge of the future lead to victory, or defeat? As a stasis-locked cassette tape, RAVAGE has no physical abilities beyond those granted by his form. However, if placed into the tape player of a compatible mechanical device (Transformer or otherwise), he can assume complete control of his new body including whatever innate abilities it may possess. He possesses knowledge of at least one future timeline, and can use this to twist events to his benefit. Rumored to be pre-loaded with an ancient hate plague virus. If seperated from a compatible body, he is completely helpless. His information storage medium is particularly vulnerable to strong magnetic fields. In Package | Back of Package | Prototype Reveal | 6 Super Versions! Scientist, Leader, Lover... Electrum Beast is all that, and more. This is one 'bot who can really cut the cheese. Sent by Optimus to guard the electrum-cheddar pools of Wisconsin. Cheddar-armor is resistant to most forms of ammunition. Has a sharp bite. Can swim unnoticed under the surface, swooping up underneath when you least expect it. 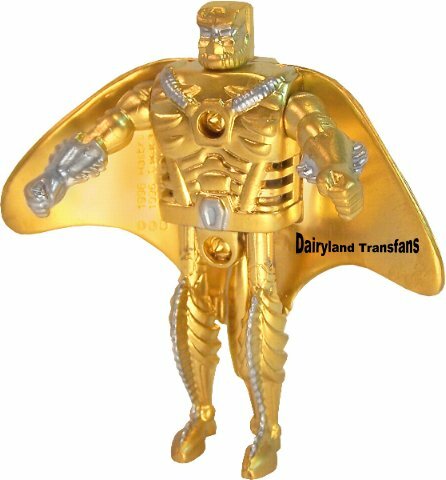 Ironically, Electrum Beast is lactose-intolerant. Ritz Crackers go where no bullet can, disabling him instantly. 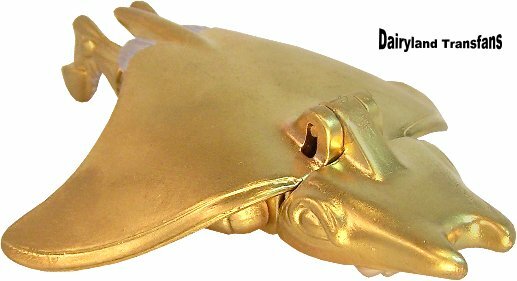 His armor is rendered useless if he is out of the electrum-cheddar for too-long. Steers: It never seemed right that Heffer was all-alone out there in the pasture, so his friends have finally come to join him. :-) Steers is a welcome addition to the Dairycon ranks. These items are all part of the 'Changing Steers' assortment. 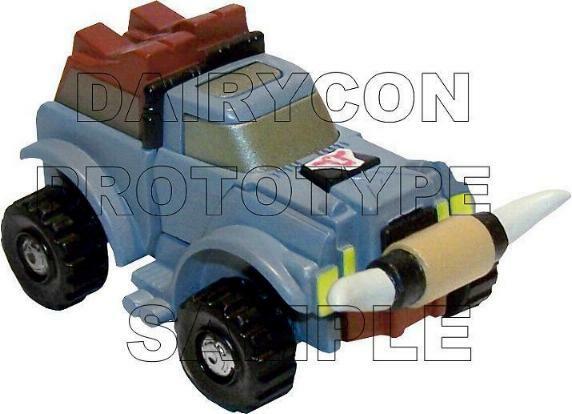 Steers is the Regular Raffle item, while ActionMaster Ravage is is the 2011 PreReg Exclusive. That leaves Electrum Beast as the LuckyDraw Gold Limited Raffle Prize.